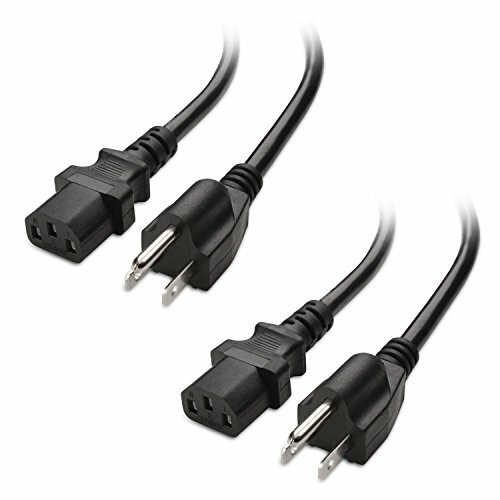 The Cable Matters 16 AWG AC power cord is an ideal replacement for a damaged or wrong length cable. It is compatible with most models of a desktop computer, display monitor, HDTV, laser printer, or large appliance with a removable cord. The DIY computer builder or IT technician can keep a spare from the 2-Pack for rebuilding old equipment or testing. The combination of a UL Listed safety with 16 AWG gauge conductors and a 13 amp / 1625 Watt rating provides a safe and reliable power cable. This power cable is backed by a lifetime warranty and product support for peace of mind when purchasing. - This power cable is not rated to be used as an extension cable.